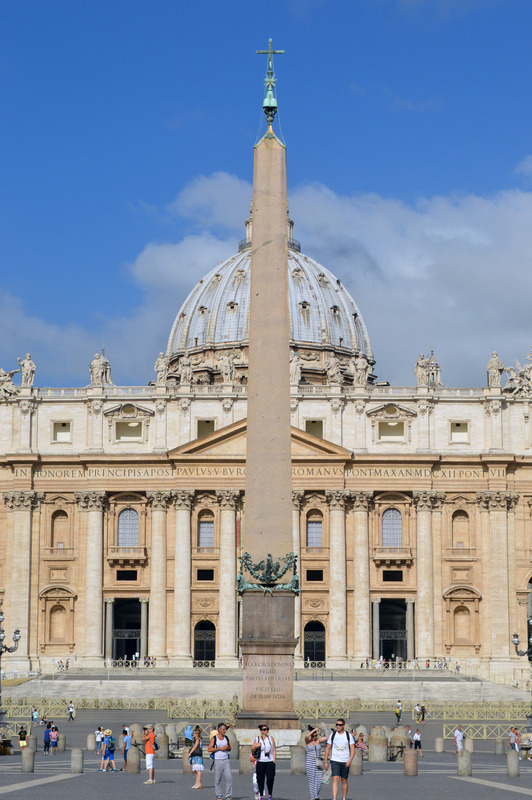 Needless to say, St. Peter's Square (Piazza San Pietro) is the large circular plaza located in front of St. Peter's Basilica in the Vatican City. Current St. Peter's Square was designed by Giovanni Lorenzo Bernini, and completed in 1667, have a width of 200 meters, depth is 165 meters, surrounded by the columns of the corridor. The obelisk is at the center of square. We can see the panoramic landscape of the square from the top of Basilica, which was designed by Michelangelo Buonarroti. It's worth to toil up to the Cupola (Dome). Although we can use the elevator until the middle way, but it's always crowded, and we must climb the narrow staircase of 320 steps after getting off the elevator. So, I walked up to the top without using the elevator. The entrance of Vatican City is about 400 meters south of Ottaviano Station on Metro Line "A". We wouldn't lose the way because many people are walking toward the Vatican City. Among them, some people are heading to the ticket office of Vatican Museum. In such a case, we should proceed in the opposite direction of the line along with the wall of Vatican City, then we can see the entrance. 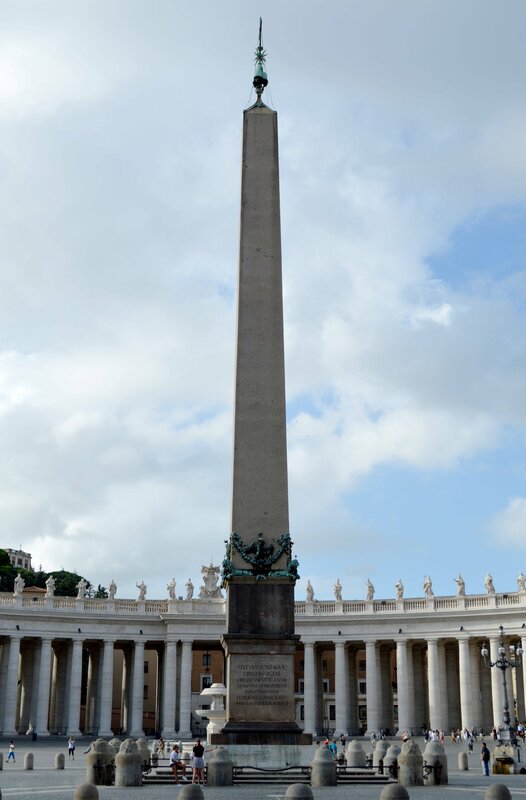 The obelisk majestically stands at the center of the square. If we see the obelisk only, we may visit here at any time. However I recommend to climb up to the Cupola of St. Peter's. But we will receive the security inspection, and the people make a long waiting line in the daytime. So, visiting early in the morning is better. Also, visiting Vatican Museums is recommended. The admission ticket for the Museums, and the Sistine Chapel (Cappella Sistina) where there are the "Last Judgment" and the ceiling paintings is a set, and is available on the day. However, it takes more than 2 hours waiting line to obtain it, so purchasing online is recommended. The Provenance: The provenance of this obelisk is not well clarified. However, The stories in "The Natural History" is often a fake, but contains a lot of interesting fantastic stories. Hence we cannot acknowledge all the contents are fact, and must handle this carefully. 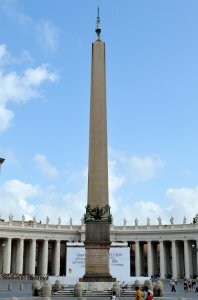 "The Natural History" doesn't refer to the location where the (pair of) obelisks were erected, and "Nuncoreus" doesn't exist in the history. Since these stories are quite similar, Pliny the Elder might have copied from Herodotus' "Histories". Pheros may be a common noun as the spelling of "pharaoh" and "pheros" are similar and this might be a derivative of "pharaoh". According to another source, "The obelisk was quarried in Aswan in the era of Amenemhet II (Middle Kingdom, 12th Dynasty, 20th century BC), and erected at the Temple of Sun in Heliopolis. However, the critical questions exist. This obelisk does not have the usual hieroglyph. It's hardly to believe the obelisk without hieroglyph was made in the time of Middle Kingdom, 12th Dynasty, in 20th century BC. It's also hardly to believe that Ramses II (13th century BC) overlooked it, and didn't make it as his own obelisk. Also, the current obelisk in Heliopolis has hieroglyph, but the Pharaoh name is Senusret I (Sesostris I), not Nuncoreus. In anyway, this obelisk was brought to Alexandria and erected at the Julian Forum in Alexandria by Gaius Cornelius Gallus, the first Roman prefect of Egypt under Octavianus (the first Roman Emperor Augustus [reigned 27 BC - AD 14]), and was taken by Roman Emperor Caligula in AD 37, for Rome, and erected it as a spina of the Caligula Circus, later the Nero Circus (Circus Gai et Neronis, or the Vatican Circus). 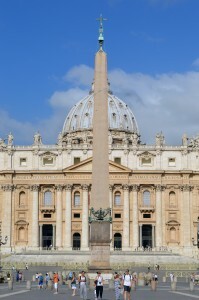 Then the Vatican Circus fell into abandonment, but the obelisk kept standing. In 1506, the transportation to the new square (St. Peter's Square) in front of St. Peter's Cathedral (the construction started in 1506) has once planned, but not done at that time. 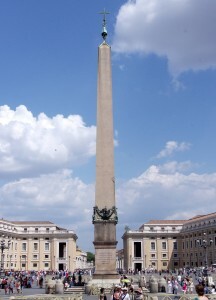 Then Pope Sixtus V [reigned in late 16th century] directed the obelisk to be re-erected at the center of the St. Peter's Square, and the work was done in 1586. 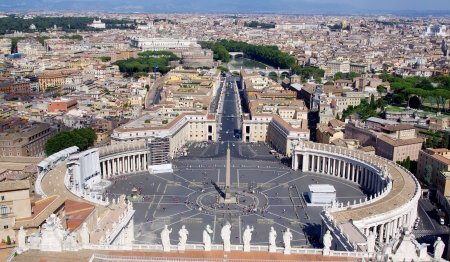 (The St. Peter's Square was completed in 1667). Of particular note is this obelisk has never toppled since it was erected in AD 37 [although it was slightly relocated by Pope Sixtus V], in spite of all other obelisks in Rome have fallen down in the Middle Ages. This obelisk is 25.37 meters high (*1) for obelisk itself. (*1) The Complete Temples of Ancient Egypt, Richard H. Wilkinson. 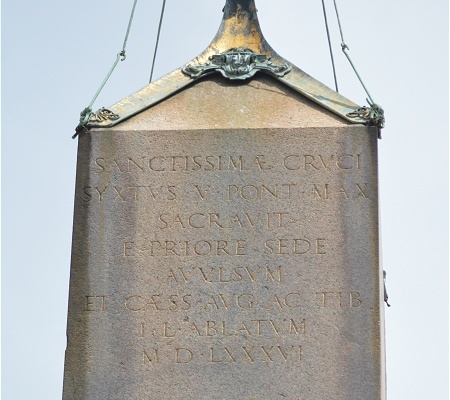 The Inscription in Latin: As mentioned above, this obelisk is known as "no inscription". However, I have recently noticed that the someting are inscribed on top and bottom of the west-side, and bottom on the east-side of the obelisk. With regard to the bottom of west-side, the website "Roman Monographs" by Andrea Pollet introduces this inscription. 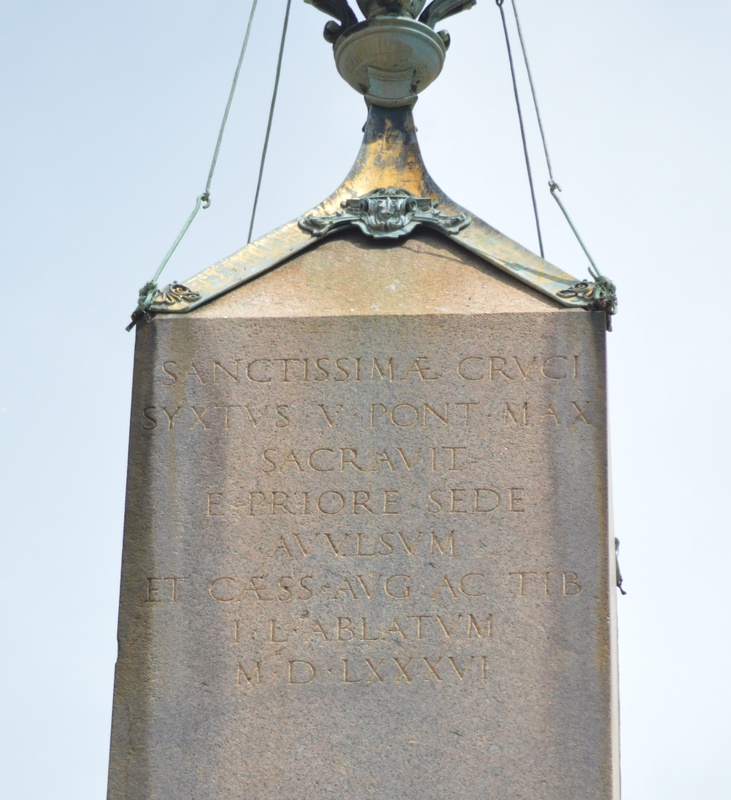 According to this site, the inscription says "Sacred to Augustus, and to Tiberius, Son (successor) of Augustus" in Latin. Further to this, according to the book entitled "The Architecture of Alexandria and Egypt, C. 300 B.C. to A.D. 700" (by Judith McKenzie), this Latin inscription was originally engraved as "the obelisk was erected in the Forum Julium [which was in Alexandria or Nikopolis] by Cornelius Gallus in 30 BC", but later changed to the current letters. Then, I actually visited in 2017 and tried to take a picture of west side of the obelisk. I assumed if the sunshine hits the front surface of the inscription, the inscription would become difficult to read. I thought when the sun was on the south side and the sun slightly hit the west side, the sun rays obliquely hit it and the inscription would be sharp. On May 9th, 2017, I went to the site at an appropriate time and captured the moment when the sun ray hits slightly. Figure 2 is the bottom of west side. Although it's hardly readable at the far right, but other parts it can read quite clearly the inscription. By my eyes, I couldn't quite confirm the old (former) inscription Mackenzie claims. But, there are scattered traces of unnatural round dots around the current inscription. An old inscription may emerge when connecting these points with lines. Figure 3 is the top of west side which was taken with using a telescopic lens. Looked the picture, unexpectedly a clear inscription remained, and I could read the whole sentence including Roman numeral M·D·LXXXVI (1586). 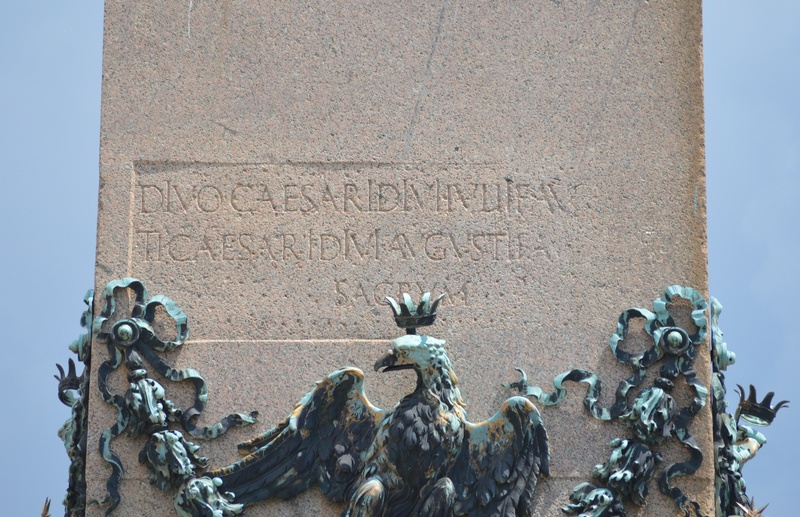 The book "The Latin Inscriptions of Rome: A Walking Guide" (by Tyler Lansford) referrs to this Latin inscription, and this says that this inscription was engraved when the obelisk was relocated by the Pope Sixtus V in 1586. Comparing two inscriptions, the bottom one was engraved when the obelisk was erected by Roman Emperor Caligula in 1st century, and the top one was engraved 1500 years after that. Hence it's quite natural that the top one remains such clearly. 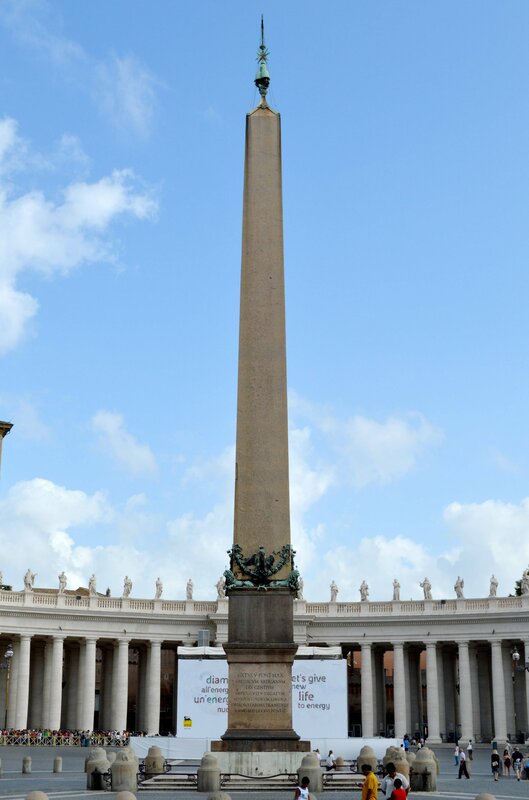 Movie "Angels & Demons": This obelisk is handled as an important site in the movie "Angels & Demons". However, since the filming at the St. Peter's Square was not allowed, the movies was made in a huge set that was made in the parking lot in Los Angeles. If we see the movie scene with knowing this, we must be impressed with this spectacular set. 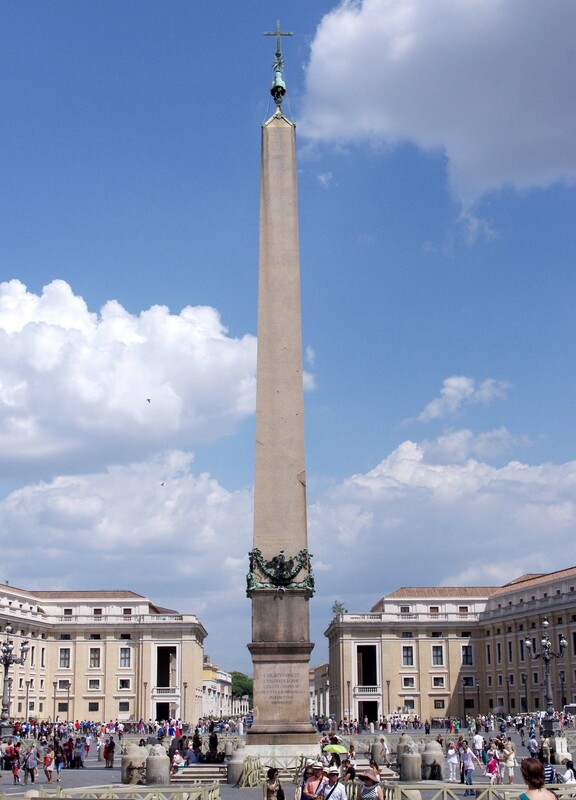 Since this obelisk stands in the center of St. Peter's Square, everybody who visits Vatican must see it. I think the site is the greatest location among all the sites of obelisk worldwide.